Huge Savings Item! Save 11% on the Mersen ST6003PYG(M) Surge-Trap Modular Surge Protective Device, 3 Pole, 600VAC, 3 Phase Wye, Auxiliary Microswitch by Mersen at Wise Warthog. MPN: ST6003PYG(M). Hurry! Limited time offer. Offer valid only while supplies last. Mersen Surge-Trap modular surge protective device (SPD) is a no-fuse, fail-safe surge suppressor featuring Mersen's patented TPMOV technology inside. View More In Phase Angle Controllers. Mersen Surge-Trap modular surge protective device (SPD) is a no-fuse, fail-safe surge suppressor featuring Mersen's patented TPMOV technology inside. The modular SPD is UL 1449 Third Edition approved. It is DIN-rail mountable featuring a fail-safe self-protected design, visual indicator and a small footprint. A remote indicator option provides status to critical control circuitry. 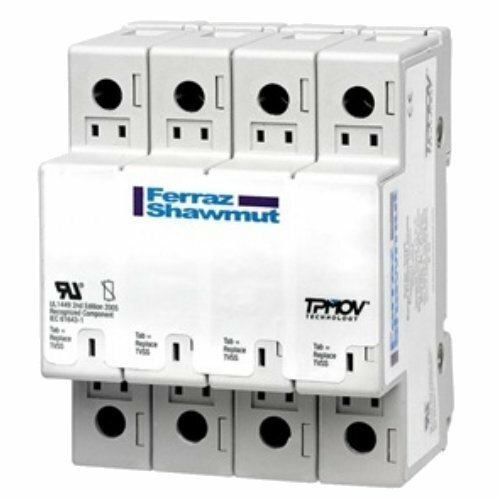 The Surge-Trap Modular SPD has a high short circuit rating and a thermally protected MOV, which eliminates the need for additional overcurrent protection devices. Remote indicator (optional). Small footprint. No additional overcurrent protection devices required. Applications: AC/DC distribution. Power supplies. Industrial automation. Telecommunications. Motor controls and starter systems. Programmable logic controller (PLC) applications. Power transfer equipment. HVAC applications. AC drives. UPS systems. Security systems. IT/Data centers. Medical equipment. Approvals: UL 1449 Third Edition Approved, File E210793. Type 4 UL Recognized Component (Tested to UL Type 2 SPD). IEC 61643-11. RoHS Compliant. ANSI/IEEE C62.41 and CE. Maximum discharge current: 50kA per phase. 20kA nominal discharge current. SCCR: 200kA. -40 degree C to +85 degree C operating and storage temperature. #6-#14AWG wiring size. Number of pole 3. 420 MCOV L-G. 347/600 nominal voltage (VCA).